Every workday, 2.25 million American energy efficiency professionals are on the job. [i] Many install insulation and advanced building controls and improve HVAC systems. Their work isn’t always recognized, but I strongly believe that it should be! For starters, energy efficiency (EE) cuts waste and costs while improving health and comfort. Our new report, Energy Efficiency Jobs in America, offers insights about EE companies and workers. I was surprised to learn that although only six percent of the U.S. workforce are veterans, eleven percent of energy efficiency workers are veterans. Yet despite biases stacking odds against them, veterans prove to be extremely adaptable and bring valuable skills and experiences to their companies. [iii] Construction companies working on energy efficiency recognize the specific skill sets veterans bring to the table. Typically, veterans are accustomed to working as part of a team, working in extreme weather conditions, and working under pressure while adapting to changing situations. With excellent leadership skills, they are good at meeting tight deadlines. All these abilities serve veterans well in EE jobs. It’s no wonder that more than one in seven EE jobs are filled by veterans in these top states: Texas, Washington, Alaska, West Virginia, D.C., Montana, Oklahoma, Louisiana, Mississippi, and Vermont. I’m heartened by hearing stories of EE workers who have returned from active duty to fill vital roles in the civilian workforce. David and Marc, members of Faces of EE, are among the ranks of ~247,500 veterans working in the United States energy efficiency industry. Strong energy efficiency policies help create fulfilling, stable jobs for the veterans who have served our country. This is very important! 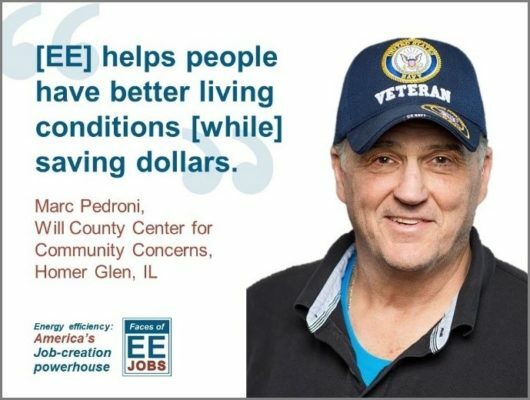 Marc Pedroni is an energy rater at Will County Center for Community Concerns in Illinois. 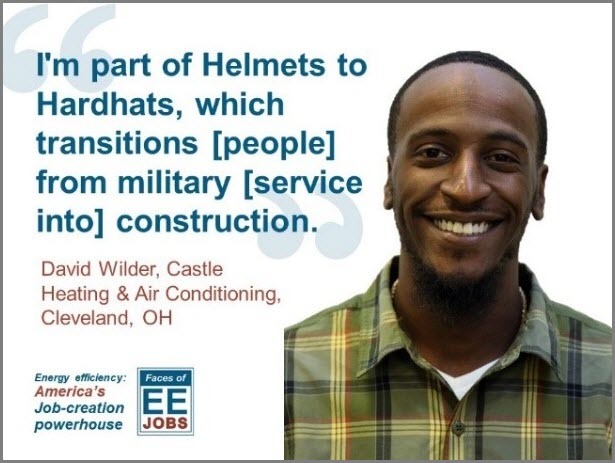 David Wilder “constructed his future” with Helmets to Hardhats, a national nonprofit that assists veterans in building solid careers. He particularly enjoys welding. If you work in the efficiency industry, we invite you to join our Faces of EE initiative spotlighting EE workers. You can download vital state-specific resources here. Also please spread the word about Energy Efficiency Jobs in America and join the conversation on social media channels this #EEDay2018 October 5, 2018.